Seismic waveforms of the earthquakes on Saturday, June 27, 2015 via the USGS monitoring equipment. 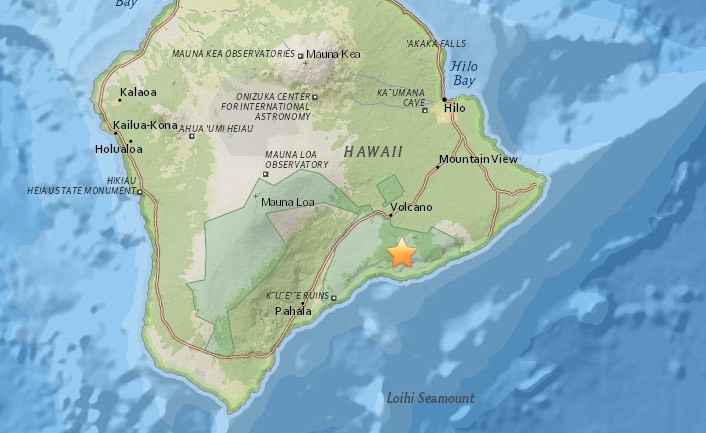 The U.S. Geological Survey’s Hawaiian Volcano Observatory (HVO) recorded a magnitude-5.2 earthquake beneath the Island of Hawaiʻi on Saturday, June 27, 2015, at 10:10 p.m., HST. The Pacific Tsunami Warning Center (ptwc.weather.gov/?region=2) determined that no damaging tsunami was generated by the earthquake. 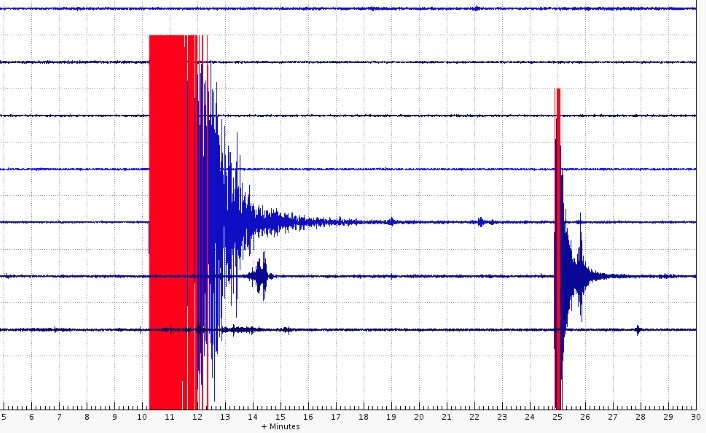 According to Wes Thelen, HVO’s Seismic Network Manager, the earthquake was centered about 11.4 km (7.1 mi) south-southeast of the summit of Kīlauea and at a depth of approximately 8.5 km (5.3 mi). 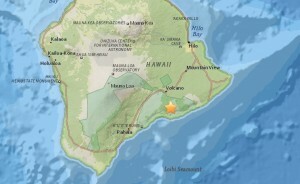 A map showing its location is posted on the HVO website at hvo.wr.usgs.gov/seismic/volcwe…. The USGS “Did you feel it?” Web site (earthquake.usgs.gov/eqcenter/d…) received more than 740 felt reports within an hour of the earthquake. It was felt across the Island of Hawaiʻi, as well as on parts of Maui, Lāna‘i, O‘ahu. Reports indicate that residents experienced light shaking (Intensity IV) during the earthquake. At these shaking intensities, damage to buildings or structures is not expected though items not properly secured could have fallen over. Five aftershocks were recorded within the first hour of the earthquake, including a magnitude-3.1 earthquake at 10:54 p.m. More aftershocks can be expected, including some that might be felt. Eight earthquakes with magnitudes of 4 or greater, including three with magnitudes of 5 or greater, have occurred in this same area, the central part of Kīlauea’s south flank, and at nearly the same depth (8–10 km or 5–6 miles), in the last 20 years. These quakes are thought to be caused by southward movement of the volcano’s south flank in response to magmatic pressure within Kilauea’s East Rift Zone.